Featuring a new Shadow Paladin doge for Ritual strategies. 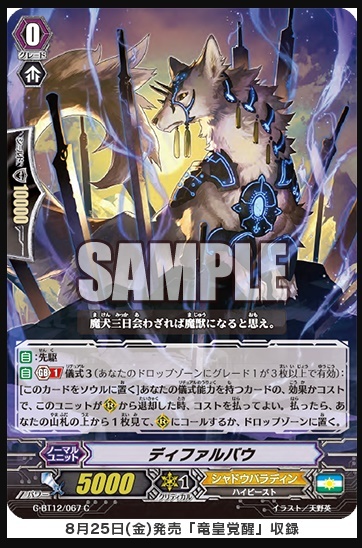 AUTO Generation Break 1 Ritual 3: [Put this unit into your soul] When this unit is retired from (RC) for the cost or effect of a card with the Ritual ability, you may pay the cost. If you do, look at the top card of your deck, call it to (RC) or put it into the drop zone. • From the 12th Booster Pack “Dragon King’s Awakening”, 《Shadow Paladin》’s “Difalbau”. The “Coral” SP Clan Pack” contains every card of Coral’s growth in every Grade in SP foiling! You’ll have all the cards needed for a linked Ride. Also, the “Duo” SP Clan Packs contain powerful past “Duo” cards! There’s a Black and White Version, so they’ll be great no matter which you get. If you get your hands on these cards, be sure to add them to your Deck! Continuing, “Difalbau” from “Dragon King’s Awakening” is a First Vanguard that activates its ability when Retired. When it’s Retired from the Rear-guard Circle for the effect or cost of a card with the Ritual ability, you can look at the top card of your Deck, then Call it or place it in the Drop Zone, which is an amazing ability! It doesn’t have to be just Units, this ability activates when used for the cost of a CARD, so for eaxample, you can activate this ability even when it’s used for the Cost of a “Dragsaver, Esras” in the Drop Zone. Also, by playing itself in the Soul, it’s quite good for Units that need Soul such as “Black-winged Swordbreaker”! For Today’s Card here on out, we’re introducing cards from the 5th Clan Booster “Prismatic Divas” and the 12th Booster “Dragon King’s Awakening”! Please enjoy!